This game combines arcade elements with a bit of strategy. There are nine rather different games packed into it, and three skill levels for each one. A fancy playing field shape gives you a great chance to excersize your pool skills. One more nice thing - the two-player modes were added - no more arguing with your relatives over whose turn is to play now. registration key any time during or after the trial period. blue hexagon at the right of the board indicate the number of unsuccessful attempts left till the end of the game round. You will get some points if the sphere you have shot joins a group of spheres of the same color and they disappear. You will get ten times more points for every sphere that fell apart if they weren't connected to the center of the board. If you haven't removed any sphere by your shot - the number of attempts decreases and when it equals to zero new lines will appear from the center of the board and a new game round will begin. New lines will appear if the sphere you have shot hits the sides of the board it has come from and disappears. But in this case you won't lose your attempts. You may choose between nine different games available (click on the `Pick game' button). First six games are single player games and the last three are multiplayer ones. In the single player game your goal is to remove all the spheres off the board. You will have twice more points if you manage to kick off all the spheres of the same color. On the other hand the number of lines that appear at the end of every game round increases too. In multiplayer games you should achieve different goals. The board is divided into two parts here. One half of which belongs to you and another - to your opponent. 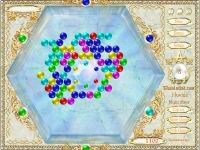 Your goal is to remove all the spheres from your half of the board and those common for both players lying on the line dividing the board. You should also fill the opponent's half and make the spheres overflow its borders. Keep in mind that the player on whose part of the board the spheres have been removed will get points. human or computer ones. You will watch the game in Demo Mode if you choose both players as computer players. Watching the Demo will help you to understand the rules of the game.